A fire-resistant system is always as efficient and reliable as the sum of its components. This is why Pilkington is consistently following the principle of a complete solution for transparent fire protection in buildings. 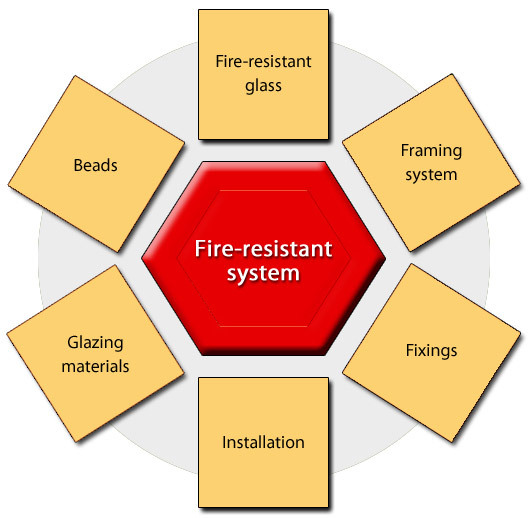 Since the market launch of fire-resistant glass, leading system manufacturers have become important partners in developing fire-resistant systems that perform reliably and consistently in the event of a fire or emergency, comprising glass, specifically designed framing systems, locking systems, hardware, fittings, sealants and adjoining wall systems. Pilkington’s close cooperation with various global system suppliers ensures application diversity and design variations in framing structures and materials: today, more than a thousand tested and approved systems are available all over the world using Pilkington Pyrostop®, Pilkington Pyrodur® and Pilkington Pyroclear® - the most convincing result of the long term success of this philosophy!